The Aro Valley Community Council Annual General Meeting (AGM) is on WEDNESDAY 25 JULY 2018 at Aro Hall. Join us to celebrate its 40th anniversary, learn about the community council and its activist history. Hear from the chairs and treasurer about 2017 - 2018 including the site development project and elect a new committee for 2018 - 2019. The committee represents Aro Valley Community Council and has a strong tradition of being involved in social action relating to local issues, such as the advocacy and action which established Aro Park and in protesting the inner-city bypass. The Community Council continues to be involved with issues which affect the community. Our public meetings and special events are often lively, and are well attended when issues that have the potential to have a local effect are under discussion. 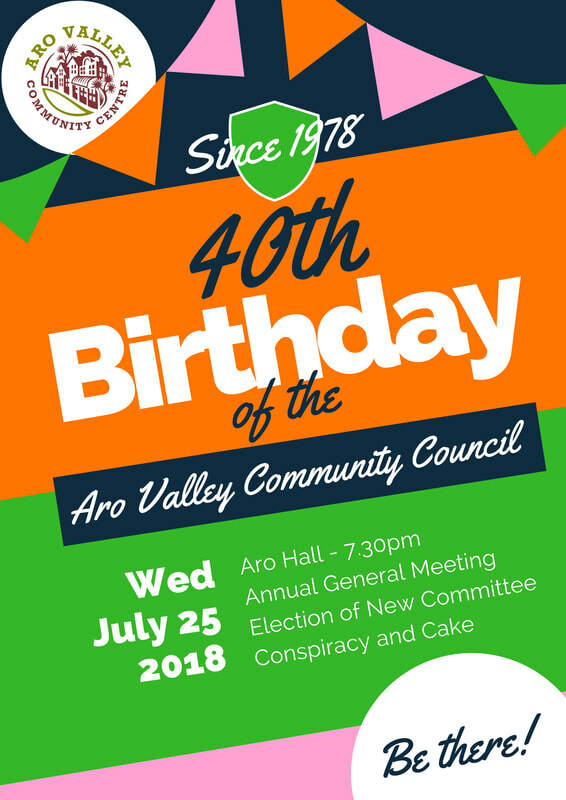 The Aro Valley Community Council Inc has been in existence since 1978 and is a registered charitable organisation run by elected volunteers from the Aro Valley. The committee also manages the Aro Valley Community Centre which employs two staff to coordinate and fund community groups, special events and projects. We have had some great success in music festivals and fairs, sustainability initiatives (Plastic Free July, Aro Cargo Bike Share), English Language classes, community gardens, shared meals, holiday programmes, emergency preparedness, soup kitchen, galleries and lots more. Regular hall users include yoga, capoeira, Aro Jam and Debbie for dance classes for kids, Qigong, Tai Chi, Meditation, Sing for your life, Sit and be fit, Taiko drumming. They are currently working on projects with Wild Aro, Polhill Restoration, Kai O Te Aro, 128 Radical Centre, Community Fridges Wellington, WREMO, Waste-ed, Aro Valley Preschool and Te Aro School. If you or someone you know would be perfect to step up to the committee, be in touch with Lexi and Tahiti at the community centre or send in the form below. The AGM Agenda will be announced shortly.